Without Obedience to God's Law, Our Faith is a Dead One. Is God's law opposed to love, grace, and faith? The Apostle Paul makes clear in Roman 13:8-10 that love is the fulfilling of the law because love puts law into action by respecting God's requirements concerning life, property, our neighbor, our enemy, and ourselves. If we commit adultery, we do not love our spouse. If we are idolaters, we do not love God. Love is more than a feeling; it is a way of life lived either in faith and obedience to God and His law, or in unbelief and disobedience. Love is the law of God put into action by a person of faith. Therefore, it is the grace of God that He has given us His commandments. 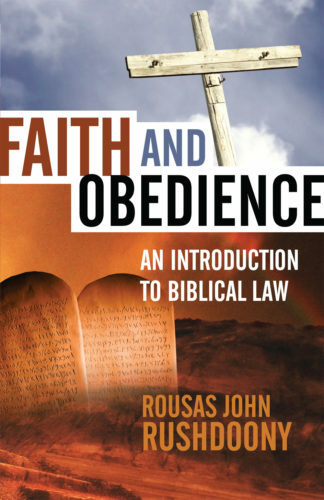 In this powerful introduction to Biblical law, R. J. Rushdoony reveals that to be born again means that where you were once governed by your own word and spirit, you are now totally governed by God's Word and Spirit. This is because every word of God is a binding word. Our money, our calling, our family, our sexuality, our political life, our economics, our sciences, our art, and all things else must be subject to God's Word and requirements. The Scripture says that "the wages of sin is death" (Rom. 6:23), and that "sin is the trangression of the law" (1 John 3:4). Therefore, to be lawless - without law - is leading our society to death. Might this explain the disasters and collapses of our time? Can you see how important such a study of God's law would be? If so, then here is your introduction.